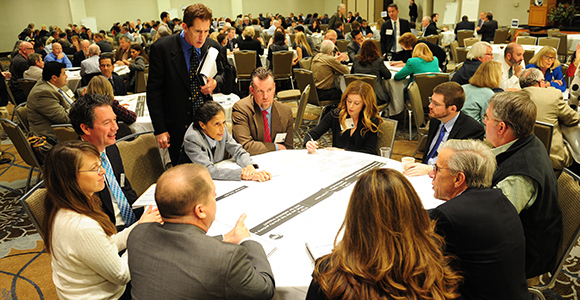 The 2015 California Economic Summit in Ontario was a big success. The sources for that claim are the people who attended the two-day event on November 12-13. A survey conducted by California Forward after the Summit of the estimated 400 attendees showed that the Summit’s emphasis on workforce, housing and water challenges that face the California economy was the right idea. Ninety-six percent of respondents agreed that the Summit is focused on the right set of priorities for supporting sustainable prosperity in California. To support state policies that will orient community colleges to prepare Californians for quality jobs and support regional coordination among colleges and employers. To use Enhanced Infrastructure Financing Districts, which have long been advanced by the Summit, to fund regional water management that will conserve, capture, and reuse water. To achieve real progress will take work and 88 percent of those surveyed said they made a commitment at the Summit to help advance one of the One Million Challenges over the next year. Another indication of the Summit’s growing influence is that it attracted major state leaders. Many of them praised the Summit and its regional approach to problem solving. "The participation and everybody's willingness to subscribe to a vision of how we can come together and look at the state of California that is going to be about shared prosperity is outstanding,” said State Controller Betty Yee, one of four statewide elected officers to attend the Summit. California Secretary of State Alex Padilla agreed: "This Summit brings talent, brains and expertise from a cross-section of Californians representing all parts of California into the same room to answer the call of what California needs to be." Ninety-two percent said the Summit plays a vital role and should be continue. (More than two-thirds believe it should be done annually). "We can't do enough of this," said Timothy White, Chancellor of the California State University system. "We have to keep a constant focus for all of us so that we don't lose track of the importance working together for California's future." The Summit process is keyed to the basic premise that California’s economy is made up of distinct regions which have common needs with other parts of the state as well as their own unique characteristics. The Summit event brings those local and regional leaders together to work on developing more middle-class jobs that reflect the state’s environmental and equity aspirations. "This isn't a top-down solution,” said State Treasurer John Chiang, who spoke about the housing challenge facing California. "We have to have efforts that take place at the local level. You have to have local leaders. You have to have community partners to make a difference." "I think the whole Summit experience is wonderful,” said Eloy Ortiz Oakley, Superintendent-President of the Long Beach City College District and co-chair of the Summit Steering Committee. “It is gratifying to see the energy from all the regions come together to make California what we want it to be." The Summit was held in Ontario, marking the first time it was held in the Inland Empire, which received high marks for hosting the event. “For over 400 people to come to the Summit held in Inland California says that they care,” said Paul Granillo who is CEO of the Inland Empire Economic Partnership and is co-chair of the Summit Committee. ”The Summit is now ingrained in the DNA of state leadership and we need to move it forward." Plans for the 2016 Summit are being formulated.